William Quincy Belle: Marissa Mayer: Has the smoke cleared yet? Has the shooting stopped? Do I put my helmet on the end of a stick and poke it out of my foxhole? If Punxsutawney Phil sees the shadow of discontent do we all have another six weeks of the winter of our discontent? For those of you who were hiking in the Himalayas and were cut off from civilisation, let's recap this story. Mayer was appointed CEO of Yahoo! on July 16, 2012 and at the age of 37; she has the distinction of being the youngest CEO of a Fortune 500 company in America. (Fast Company) That unto itself was worthy of many lines of comment and analysis in newspapers, magazines and blogs but this was only the beginning. Ms. Mayer arrived at her job five months pregnant. She apparently only took two weeks after having the baby. With her own money, she had a nursery built at work. The analysis and comments grew by leaps and bounds. Then came the February 2013 bombshell: an edict from the CEO to ban all remote work as of June 2013. The mommy sphere became apoplectic. Feminists went ballistic. Analysts were astounded by what they claimed was an antiquated, out of touch throwback to a by-gone era where information technology had not yet connected us all twenty-four by seven. Is face time that important? When I say macro, I'm talking about the entire population. I'm talking about everybody together as in 100% of the people. When I say micro, I'm talking about a specific case, one individual worker. I am very much a follower of the idea that "the plural of anecdote is not data". In other words, we have to be careful of assessing a situation by judging one or two examples. We need a university sanctioned methodology of double blind testing with a statistically significant cross-section of society. Years ago I read a study in France whereby an industry analyst had stated that the country had an untapped labour resource: stay at home moms. The number one priority for these women was their families but that didn't mean they didn't want to work. Industries which had offered flexible work hours, daycare facilities, and remote access had been able to make use of an underutilised or unused labour force. The dilemma all along was that traditional industry was demanding workers to show up from 9 to 5. If industry could change the rules of the game by organising work around a flexible schedule, those who had non-traditional schedules like mothers could participate. From the big picture, the macro level, the analyst was pointing out that France, an entire country, could be doing a better job and possibly be more productive in the world market. You're a mother. You just had a baby two weeks ago. NASA has offered you a 12 month posting to its Antarctic research station. Can you have it all? No. You're not going. You are not going to accept the posting. Your child comes first. On the other hand, should NASA offer you the posting in the first place? They need somebody for 12 months. It would seem you are not a candidate who could commit to 12 months. But wait. Is not offering you the job being sexist? Is not offering you the job violating some labour law? Over twenty years ago I worked for a small company. (Small = 50 employees) My boss was a woman, the vice-president. When she held her divisional meeting, there were six people at the table, four women and two men. I was one of the men. One day the president gave my boss a project to be completed in one year. She decided to first look at internal candidates and a female administrative assistant seemed like the best choice. I will call her Nicky. However, it was common knowledge that Nicky, who was not married but living with her boyfriend, wanted to get pregnant and have a baby. I remember sitting in a number of meetings listening to my boss (a woman) talk with the head of the secretarial pool (a woman) and the head of the department (a woman) where Nicky worked about how to complete the project in one year if the main candidate was going to have a baby and go on maternity leave for six months in the middle of the project. I left the company shortly thereafter and never did hear what happen. Was Nicky hired or did my boss go with another candidate to ensure the project was completed on time? This story exemplifies the problems of the macro and the micro. In the macro, a project may be undertaken by a team of twenty-five people. If Nicky is sick and off for a few days or if Nicky has a baby and disappears for six months, the team and the project carry on. If a table has many legs, removing one of the legs doesn't cause the table to fall over. In the micro, a project may be undertaken by just one person. There is no redundancy in the team. If Nicky gets sick and is off for a few days or Nicky has a baby and disappears for six months, the project comes to a halt. Yes, there are temps but the original person being out of the picture means the responsibility of the project now falls on somebody outside the team. If a table only has a couple of legs or even one leg, the removal of a leg causes the table to fall over. What should my boss have done about Nicky? My boss had the responsibility of seeing the project completed in one year for her boss. Should she have chosen Nicky and run the risk of Nicky disappearing? This seems like a perfect example of the age-old dilemma of women not being chosen in the workplace because, well, they're women who invariably have priorities other than the job. Personally I found it ironic that my boss, a woman, had to deal with this issue. What's the right answer? It depends on the macro and the micro. There isn't a one size fits all solution. Not in the least. Nobody writes on the tombstone "I wish I had worked more." We all need balance in our lives. Like France, I'm sure any industry could benefit from being considerate towards its employees and that consideration will translate into loyalty and better productivity. Admittedly there will always be a rotten apple in the bunch but in general, no in the majority of cases, a considerate boss will be rewarded. And I am saying that based on experience. Maybe not every industry understands flex hours. Maybe not every industry knows how to manage an untapped resource like people who require a flexible work schedule or even remote access. Let's hope they will learn. Who the hell does Marissa Mayer think she is? Yahoo! has 14,100 employees. That's a lot of employees. I wonder what they're all doing. Marissa Mayer makes a decision and public vilifies her for it. Hmmm, do I know what's going on at Yahoo? Is Mayer's decision a threat to working mommies everywhere? Does Mayer deserve the scorn of the world? 14,100 employees. Hmmm, I wonder what they're all doing. So, why did Yahoo CEO Marissa Mayer make it? We spoke with a source familiar with Mayer's thought process on the matter. Here is what that person told us. Many of these people "weren't productive," says this source. "A lot of people hid. There were all these employees [working remotely] and nobody knew they were still at Yahoo." These people aren't just Yahoo customer support reps. They're in all divisions, from marketing to engineering. Mayer is happy to give Yahoo employees standard Silicon Valley benefits like free food and free smartphones. But our source says the kinds of work-from-home arrangements popular at Yahoo were not common to other Valley companies like Google or Facebook. "This is a collaborative business." Mayer saw another side-benefit to making this move. She knows that some remote workers won't want to start coming into the office and so they will quit. That helps Yahoo, which needs to cut costs. It's a layoff that's not a layoff. Bigger picture: This is about Mayer "carefully getting to problems created by Yahoo's huge, bloated infrastructure." The company got fat and lazy over the past 15 years, and this is Mayer getting it into fighting shape. Mayer's male peers at big technology companies--Larry Page, Jeff Bezos, Bill Gates--aren't bothered with this line of questioning. ("Mr. Jobs, is it difficult to be seen as a role model for men?" Sounds wrong, doesn't it?) And it's not just because they're men. It's because they're busy running companies. Mayer’s decisions have been consistently discussed not on the basis of whether they are appropriate for a CEO, but whether they offend her role as a representative for working women everywhere. Who hell does Marissa Mayer think she is? She doesn't think she's the CEO, she knows it. Why is she doing it? She's running a company. Several former Yahoo employees are coming forward in support of Mayer, saying that some of the company's employees took the leniency around telecommuting too far. “Mayer has found out just how dysfunctional the company can be,” said one former online editor at Yahoo, who recently left the company and agreed to speak to The Huffington Post on the condition of anonymity. The debate goes on. But is it the right debate? If Marissa Mayer was a man would this discussion even be going on? Ms. Mayer is running a company. It would seem she has discovered some gross inefficiencies in the operation of said company. She just doesn't have the right; she has the mandate to run the company as best as possible. People are abusing the system and she has to stop it. The pendulum has swung too far one way and now it's swinging back. Maybe too far in the short-term but I'm sure that will change. Telecommuting is great. Working from home is great. Flex hours are great. But, and this is a big but, there have to be limits. Companies are a collaborative effort. People work together and it is there we have synergy. This isn't to say I discount telecommuting... sometimes, emphasis on sometimes, but somewhere there is a happy medium. I go back to what a Yahoo insider reported. People never show up at the office. Never? An employee looks for his manager and can't find him. What? Is too much for a company to ask an employee to show up for work? "The surprising question we get is: 'How many people telecommute at Google?' And our answer is: 'As few as possible,'" Patrick Pichette, Google's chief financial officer, said recently. "There is something magical about spending the time together." 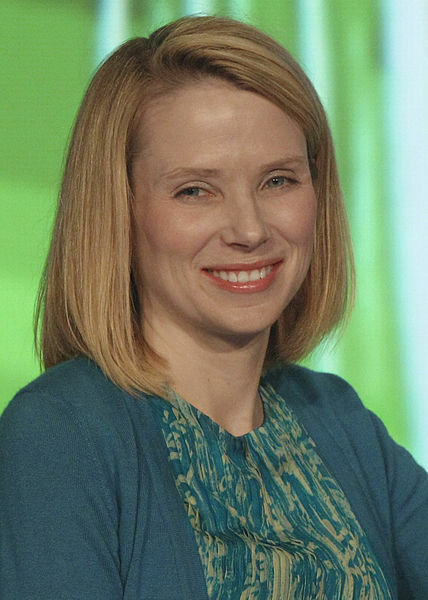 Marissa Mayer is one of 42 female CEOs out of the Fortune 1,000 biggest revenue companies. Maybe, just maybe, people should be judging Marissa Mayer as CEO. That may turn out to be her biggest success as a woman. Marissa Ann Mayer (born May 30, 1975) is an American business executive. As of 2013 she is the president and CEO of Yahoo!. In case you've lost track, she's the CEO of Yahoo. Not Working Women Inc.
Everything that I have read about her suggests that Marissa Mayer is resolute in her desire to make Yahoo the best. And she is willing to make radical choices to get there. I have to respect that. I also won’t call her bad names because she is being tough. It is unclear to me what motivated Yahoo to make this decision. Last Friday, Yahoo HR boss Jackie Reses sent out a memo telling all remote employees that they needed to find a way to be working in an office by June. This upset lots of Yahoo employees – including some working mothers... But we've just heard from a former Yahoo engineer who tells us Mayer is making the exact right call. After spending months frustrated at how empty Yahoo parking lots were, Mayer consulted Yahoo's VPN logs to see if remote employees were checking in enough. Mayer discovered they were not — and her decision was made. While working remotely, more than 2 in 5 (43%) say they have watched TV or a movie, 1 in 3 (35%) did household chores and more than 1 in 4 (28%) have cooked dinner. And who says working parents don’t know how to have fun? Parents are more likely than non-parents to watch TV or a movie and play a video game while working away from the office. Mayer is right. For Yahoo to be an innovative technology giant, people need to be physically together: In fact, tech giants like Facebook and Google don’t encourage employees to work from home. In fact, their offices are designed so employees will want to come to (and stay at) work. Silicon Valley takes much of the credit for the telecommuting boom. It makes the technology that helps workers plug in from anywhere they have an Internet connection. But the unwritten rule at major Silicon Valley companies is: Just because you can work from anywhere doesn't mean you should. Most Silicon Valley companies such as Google and Facebook Inc. have informal policies allowing telecommuting, but they champion the concept of closeness. They design their campuses to encourage it with gourmet cafes dishing out free food and inviting, comfortable meeting rooms where employees can lounge and talk. I agree with Mayer. Why? Because this debate is not about individual productivity; it is about company productivity. There is little room for argument that in today's world an employee can be productive from virtually anywhere and at any time, but a company is not merely the sum of its parts. And collaboration is key to fostering innovation. The Sexism Began When She Did... Women, shockingly, were especially harsh. "We all applaud her, but she's superhuman, rich, and in charge," responded Anne-Marie Slaughter, a professor of politics and international affairs at Princeton University and author of a much-discussed piece for Atlantic Monthly, "Why Women Still Can't Have It All." Marissa Mayer isn't "really a realistic role model for hundreds of thousands of women who are trying to figure out how you make it to the top and have a family at the same time," Slaughter contended. Men Far Outnumber Women As CEOs: Well, instead of insulting Mayer by saying she's "superhuman," and not a "realistic" role model, and criticizing her for paying for a nursery at her own expense, we SHOULD be applauding her. She is one of only 42 female CEOs in the Fortune 1,000 biggest revenue companies. Did you get that -- 42 out of 1,000? This is a list of women who currently hold CEO positions at companies that rank on the 2012 Fortune 1000 lists. Women currently hold 4.2 percent of Fortune 500 CEO positions and 4.2 percent of Fortune 1000 CEO positions. Okay. I wasn't so much bothered because she's a woman, but you make a good argument. However, she nixed flex time/telecommuting altogether when she could have just reduced the time allowed. One of my readers left a comment on my MM piece -- she lives in Sweden where telecommuting/flex time is, according to her, the norm and she feels that it makes people productive. So maybe there's something else at play? I think Sweden in general is more community-oriented than profit-oriented, while in America it's profit before all else and everyone out for himself. I guess what I'm saying is: how does the context of culture and the amount to which workers feel supported or unsupported inform our stance on work-from-home? My reading is that this story has nothing to do with working mothers or telecommuting. This has everything to do with reigning in an out of control workforce. This isn't about any one person, any one working mother, this is about a CEO trying to get a grip on 14,000 people. 14,000! Holy smokes! Yes, there may be some collateral damage but if the company doesn't make a profit and goes bankrupt, there will be 14,000 people out of work. I am confident telecommuting will come back. But when it does, it will come back with tighter controls and better management. I telecommute all the time and have flex hours but I still have to show up for work. The environment at my company (and other companies including I'm sure Google, Apple and Yahoo) is friendly to parents with families. And yes, that includes working mothers. But you do have to show up once in a while. Is that asking too much?